Visit Victoria Falls – Zimbabwe or Zambia? Are you planning to visit Victoria Falls? Should you do visit from Zimbabwe or Zambia? 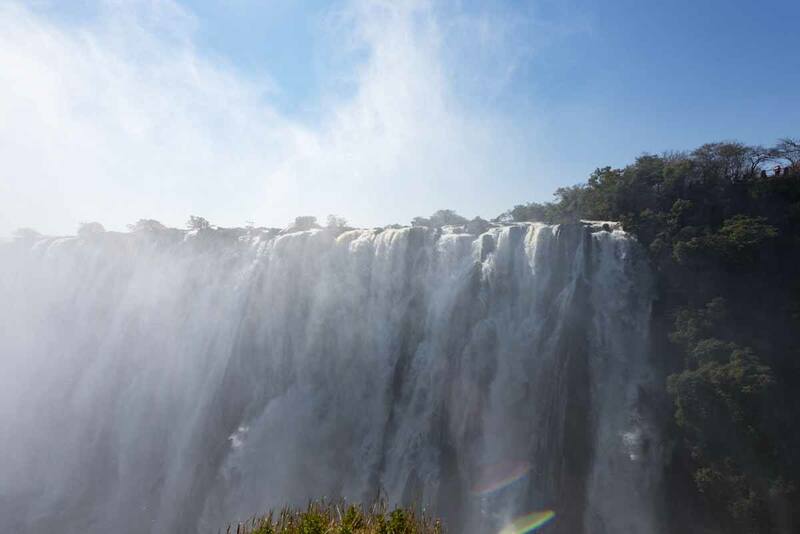 Here is our complete guide on what to see and do in Victoria Falls, Zimbabwe and Zambia side. 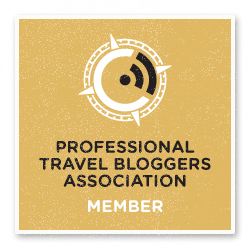 Including where to stay, practical visa info and money-saving tips! 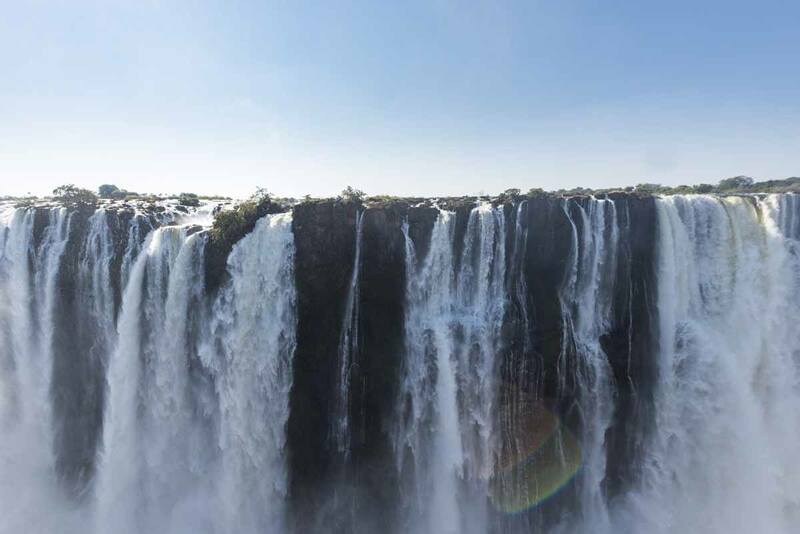 First things first – Victoria Falls is one of the most spellbinding sights we’ve ever seen. If you’re planning to visit Botswana, South Africa or Namibia, you simply MUST extend your trip for a few days and visit Victoria Falls – trust me, you won’t be disappointed. I’ll save the ooohs and aaaahs for another time – after all, there is no superlative that can match the wonder you’ll feel while standing in the wake of the Falls. 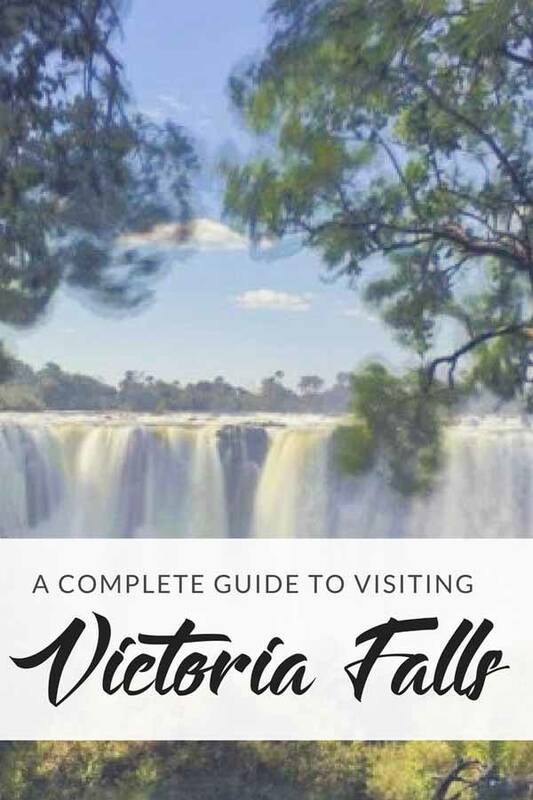 The aim of this article is to offer a practical guide to help you plan your visit to Victoria Falls, including both the Zimbabwe and Zambia side. Which Country is Victoria Falls in? 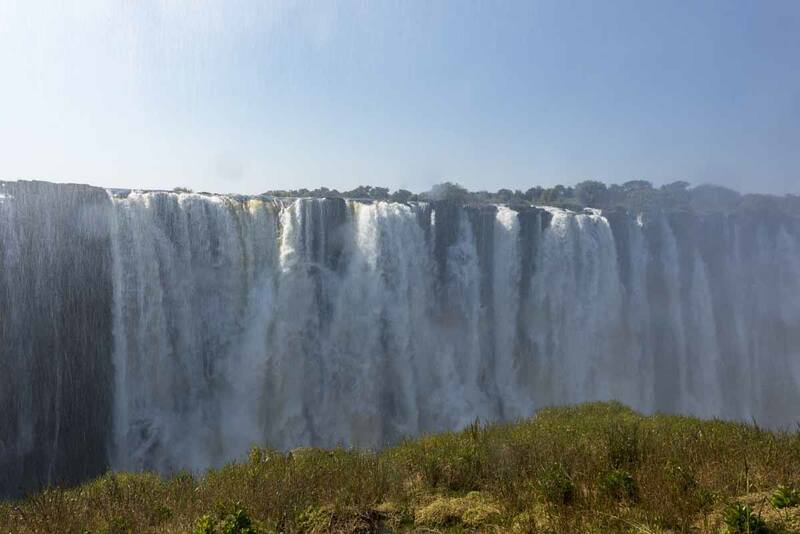 Visiting Victoria Falls – Zimbabwe or Zambia? Victoria Falls are located at the border between Zambia and Zimbabwe – they are created by the Zambezi River, jumping from a height of 108 meters as it flows from Zambia into Zimbabwe, before making its way to the Indian Ocean in Mozambique. They are not the tallest (that would be Salto Angel in Venezuela), or the widest waterfalls in the world – the record belongs to Iguazu Falls – but they do have the largest sheet of cascading water, 1708 meters wide. The great British explorer David Livingstone is often credited as being the ‘discoverer’ of Victoria Falls – but really, the local Tonga people had known the Falls for centuries – their name for them was Mosi Oa Tunya, translating as ‘the smoke that thunders’, which is also the name of the national park on the Zambian side of the falls. Can you imagine how it would feel to see THIS for the first time? 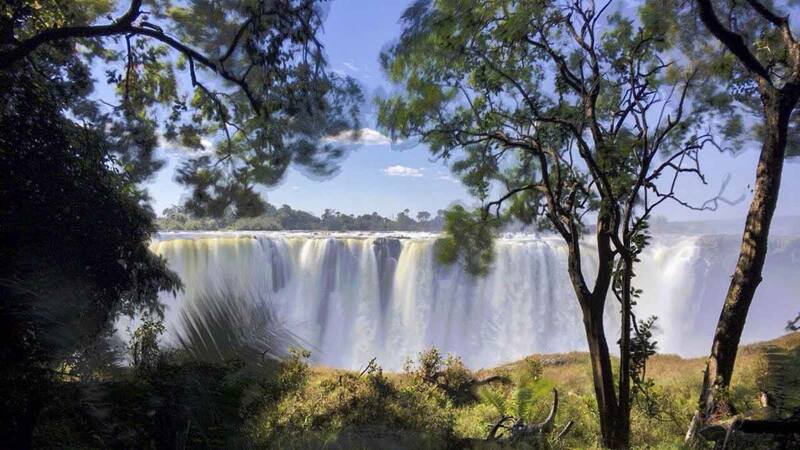 The Tonga people of the Zambezi valley had many legends about the falls. One of them tells the story of the Nyami-nyami, their very own version of the Loch Ness monster, inhabiting the bottom of the Zambezi river around the waterfalls. The Nyami-nyami is believed to be a giant snake-like creature with a fish head, revealing itself from time to time – local rafting guides sometimes sport Nyami-nyami necklaces to show respect for the mythical creature. Livingstone was indeed the first Westerner to lay eyes on the mighty falls on November 16th, 1855. 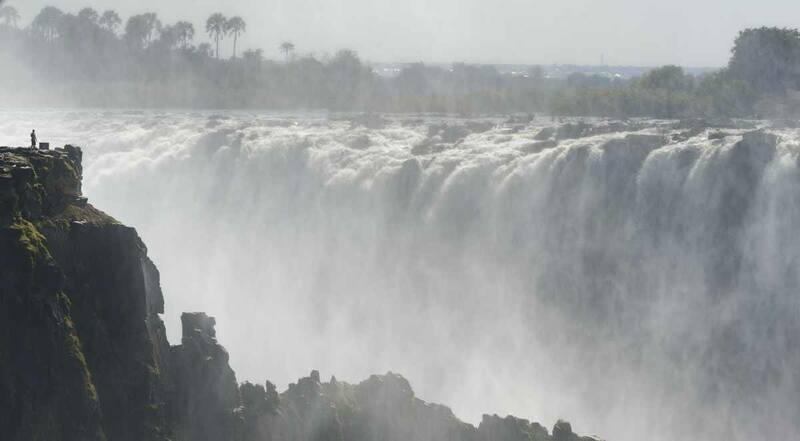 He then renamed them Victoria Falls, in honour of the British Queen – nowadays UNESCO recognises both Mosi Oa Tunya and Victoria Falls as official names for the site. We reached Victoria Falls, the town on the Zimbabwe side of the Falls, by overland truck. It was the last point on our overland Namibia safari with Wild Dog Safaris, which also included a week travelling through Botswana. 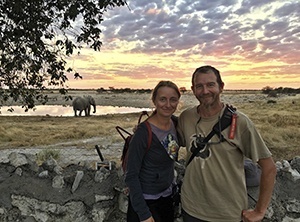 We found that reaching Victoria Falls by overland truck was a brilliant idea – not only was it an epic ending to a spectacular trip, but also having our guides with us for a couple of days allowed us to get their advice on practical matters like visa, money and getting around. But more on this later. The most straightforward way to reach Victoria Falls from elsewhere in Africa is by plane – there are airports in both Victoria Falls (Zimbabwe side) and Livingstone, the town on the Zambian side of the border, with regular flights to destinations like Nairobi, Joburg and Cape Town. Easy to reach from all over Southern Africa! If you prefer to travel by bus, you can reach Livingstone from Windhoek with Intercape. There are three weekly buses crossing at the Katima Mulilo border – but beware as you won’t be able to get a Kaza Visa from that location. You can also travel to Livingstone from Lusaka with Mazhandu Family Bus (5-6 hours), and to Victoria Falls from Harare with Pathfinder (12 hours). Getting to Victoria Falls by train is probably the most scenic way to arrive – you can reach the station on the Zimbabwe side by luxury train from South Africa, or with overnight trains from Bulawayo. You can also travel by train between Lusaka and Livingstone. If you’re coming from Botswana, the town of Kasane (accommodation and activity hub for Chobe National Park) is close to the 4-country border with Namibia, Zambia and Zimbabwe. From there, you can easily get shared taxis to Livingstone and Victoria Falls, about an hour away via the Kazungula border. Any time is a good time to visit Victoria Falls, as the rainy and dry season both have their advantages. The rainy season runs from November to early April. The months immediately after the rainy season is when you’ll see the falls at their fullest capacity – which is spectacular indeed, but the mist may end up hiding the falls from view and you’ll get wet for sure! The driest months are from August to November – this is the ideal time to visit if you’re into photography, and if you want to head to Livingstone Island on the Zambian side and swim in the infamous Devil’s Pool. We visited in early July and Devil’s Pool was still closed. Check out the mist rising – July is still wet season! Both Zambia and Zimbabwe require a visa to enter the country for most nationalities. 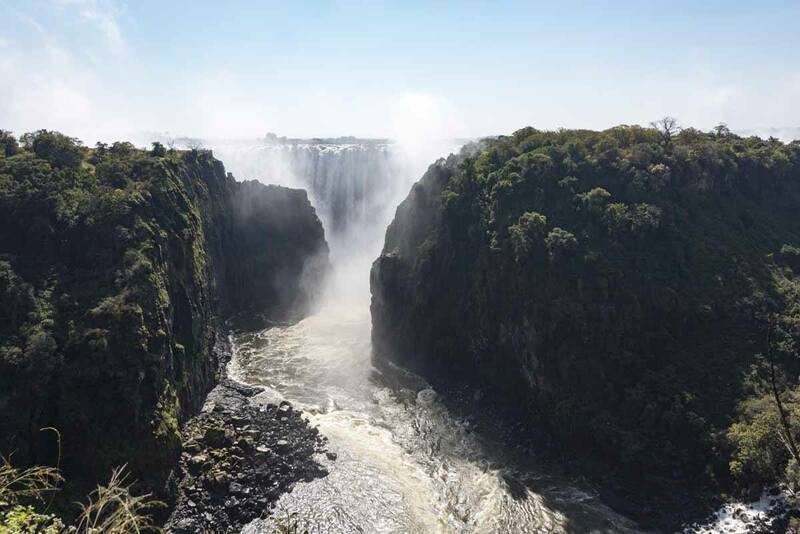 Visas on arrival are available both at Victoria Falls and Livingstone airport, as well as all land crossings, both beware – unless you specify otherwise, you’ll be issued a single-entry visa (between US$ 30 and 50, depending on your passport). 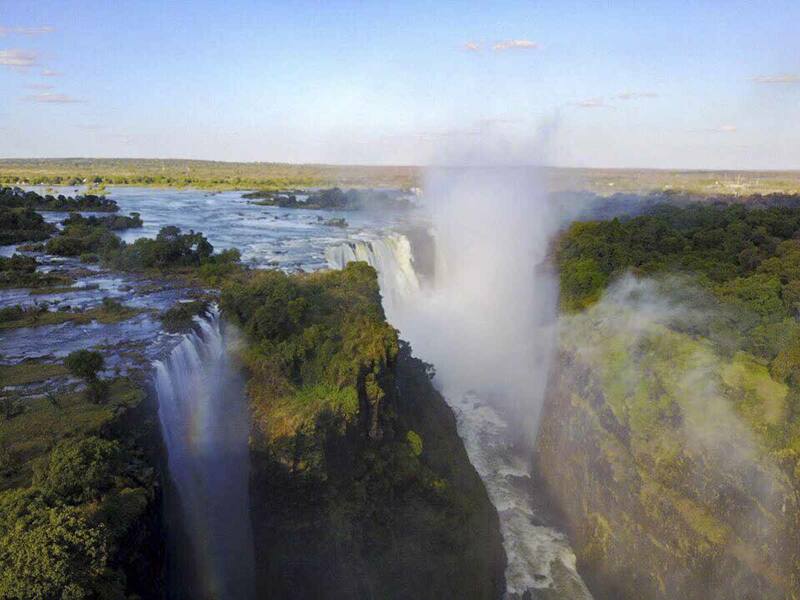 If you want to visit Victoria Falls both in Zimbabwe and Zambia, the best bet is getting a KAZA visa, (also called Univisa) which allows free movement between Zambia, Zimbabwe and the Chobe area of Botswana for up to 30 days. A KAZA visa costs US$55, making it a far more convenient option than paying for single-entry visa each time, but there is a catch – it’s only available at Vic Falls, Livingstone, Harare and Lusaka airports, or at the Kazungula land border cross, and you need to let the border agent know that you want one (if you don’t say anything, you’ll be issued a single entry visa). KAZA visas are only available to 65 nationalities – including most EU countries, UK, Australia, US, Canada, Israel – but NOT Ireland. 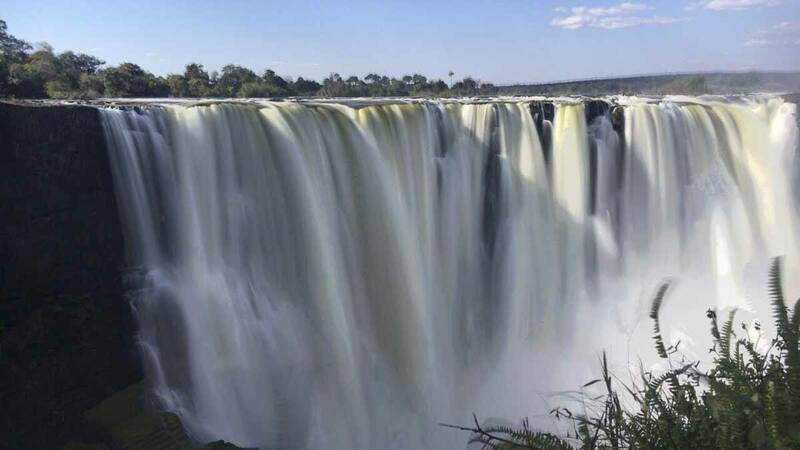 Just like the famous Iguazu Falls standing on the border between Brazil and Argentina, Victoria Falls are also located on the border between two countries – Zambia and Zimbabwe. Those who have visited Iguazu Falls will know that it’s worth seeing the waterfalls from both countries – Brazil offers the ‘grand overview’, while Argentina allows you to get close to the falls. Victoria Falls isn’t quite the same – the experience that you’d have visiting the falls from both sides isn’t that different, but if you do have time, we recommend heading to both national parks. Let’s start with visiting Victoria Falls from Zimbabwe. If you only have time for one country, I would recommend Zimbabwe, as about 75% of the fall surface is visible from that side. The entrance to the national park is walking distance from Victoria Falls town, and entrance tickets cost $30. From there, a concrete walkway leads you to a series of viewpoints, all clearly marked from 1 to 13, with signs explaining what it is that you’re looking at. Zimbabwe – the grand overview! 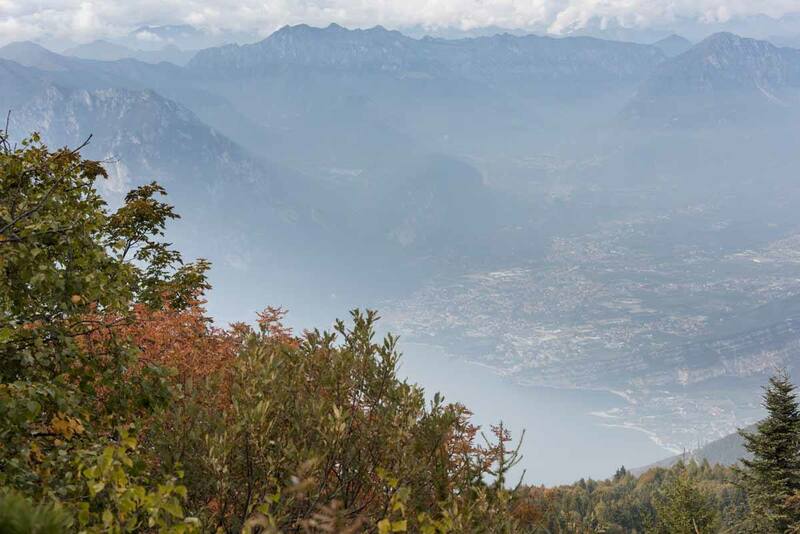 From the park entrance, walk down the path then turn left – the first viewpoint is where you’ll find Livingstone’s statue, and a spectacular view of the Western side of the falls. 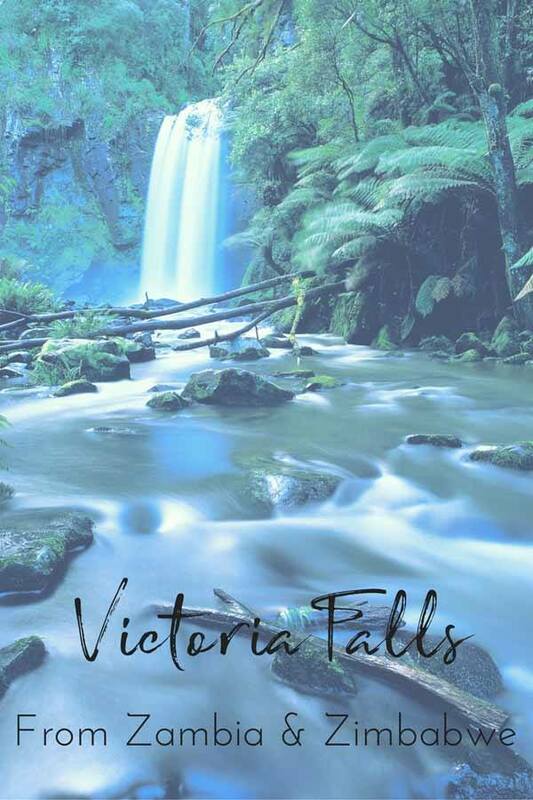 As you progress from one viewpoint to another, you’ll find that views over the falls just keep getting better and better as you progress from one viewpoint to another – the Main Falls is probably the best, closely followed by Horseshoe Falls. The last viewpoint is over the Victoria Falls Bridge, a steel bridge opened in 1905, that is still the main link between the countries. Visiting Victoria Falls from the Zimbabwean side will take between 2 and 4 hours, depending on how fast you move and how long you want to stop to take in the majesty of the falls. On the Zambian side, you can visit the Mosi Oa Tunya national park, located just across the Zambia-Zimbabwe border, about 10 km from the town of Livingstone. 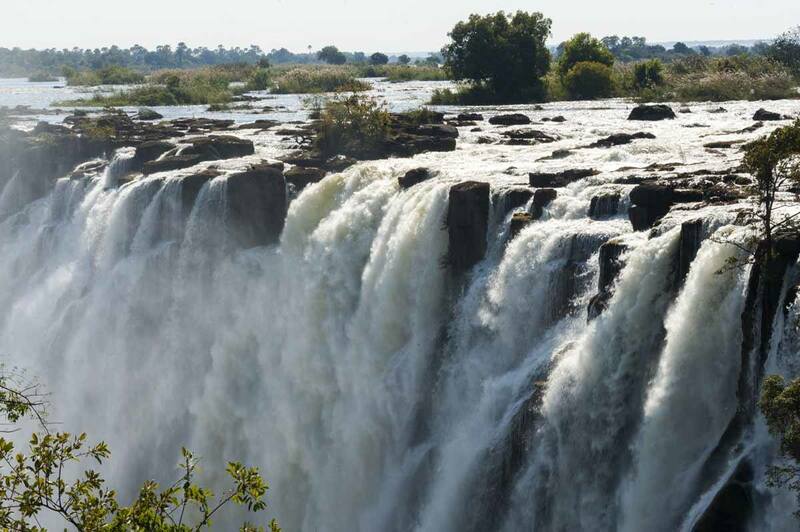 The park sees fewer visitors compared to the Zimbabwe side, as only about 25% of the falls is visible. However, the price is considerably lower – when we visited in July 2017 we paid 190 kwacha, about US$20. You need to have your passport with you when you buy the tickets. As you enter the Mosi Oa Tunya park, you have the choice to follow four itineraries, each of them offering very different experiences. We were also offered the services of a local guide, something that didn’t seem available on the Zimbabwe side, but we declined. The first trail was named ‘Photography Walk’ and took us across the Eastern side of the fall, far enough to get a good view without getting soaked. 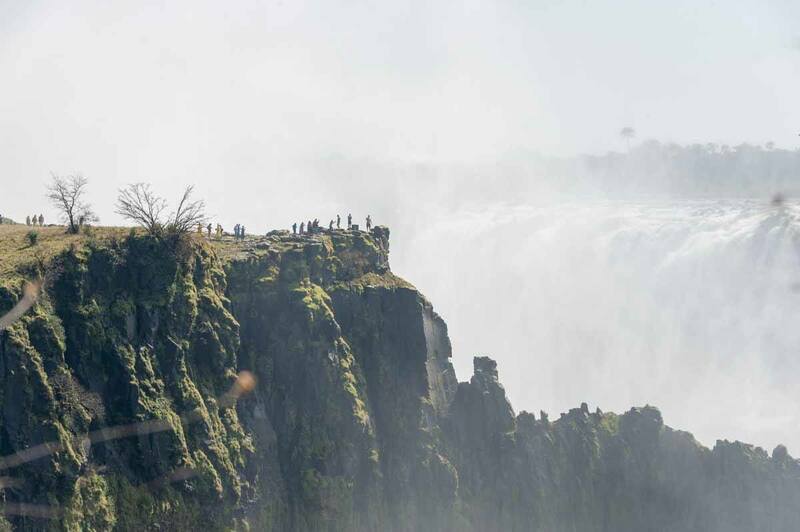 The second led us to the ‘Boiling Pot’, a point in the Zambezi river, right below the Victoria Falls bridge, where we could see bungee jumpers braving the famous Victoria Falls jump into the whirlpools below. Another trail included a walkway, allowing you to get really close to the falls (read: really wet) and the final walk is the best to get a good view of Livingstone island and the edge of the Falls without taking the pricey Livingstone Island/Devil’s Pool tour. 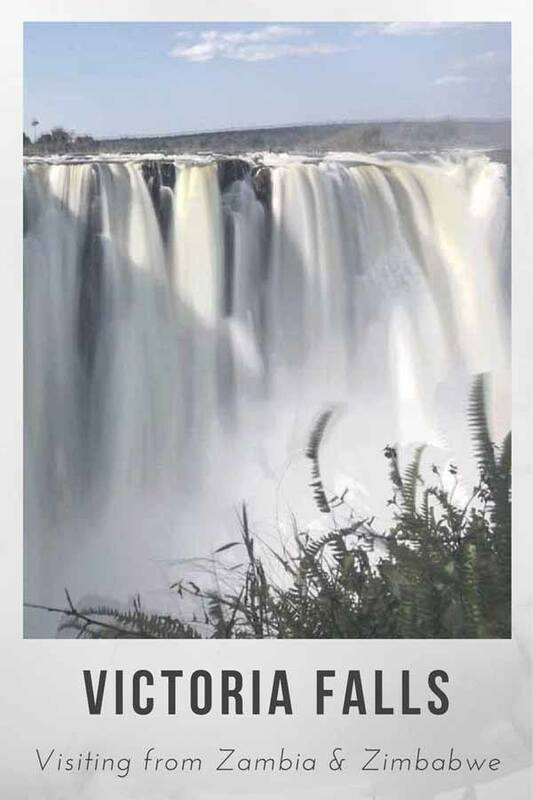 All in all, the Zambian side of the falls may not be quite as spectacular as Zimbabwe, but you’ll definitely get to see the falls from different viewpoints – from the top, from the bottom, from the side. 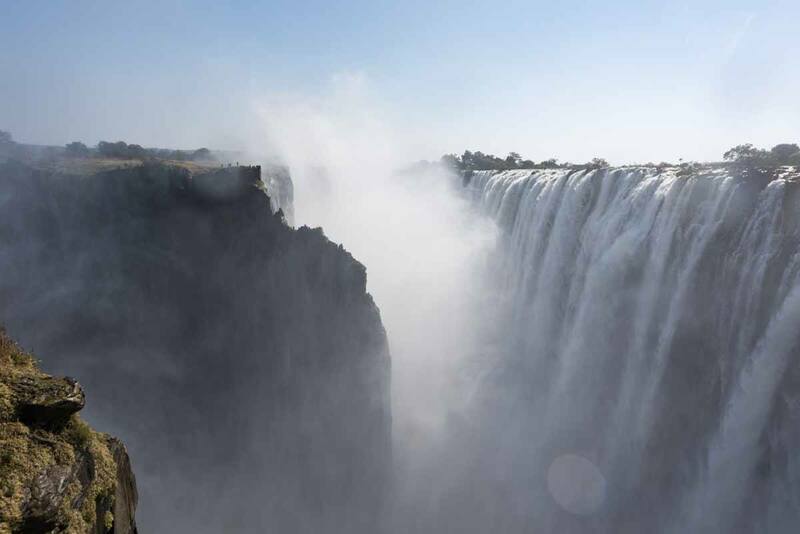 Visiting the Zambia side of Victoria Falls will also take between 2 and 4 hours. Finally, both the Zimbabwe and Zambia side offer full moon tours of Victoria Falls on three nights every month. Vic Falls is one of the few places in the world where you’re able to regularly see lunar rainbows – exactly the same phenomenon as ‘regular’ rainbows, but with moonlight rather than sunlight. Lunar rainbows (or ‘moonbows’) are much fainter than normal ones, and it’s hard to see them unless the sky is clear – for this reason, tours are often cancelled when it’s cloudy or rainy. 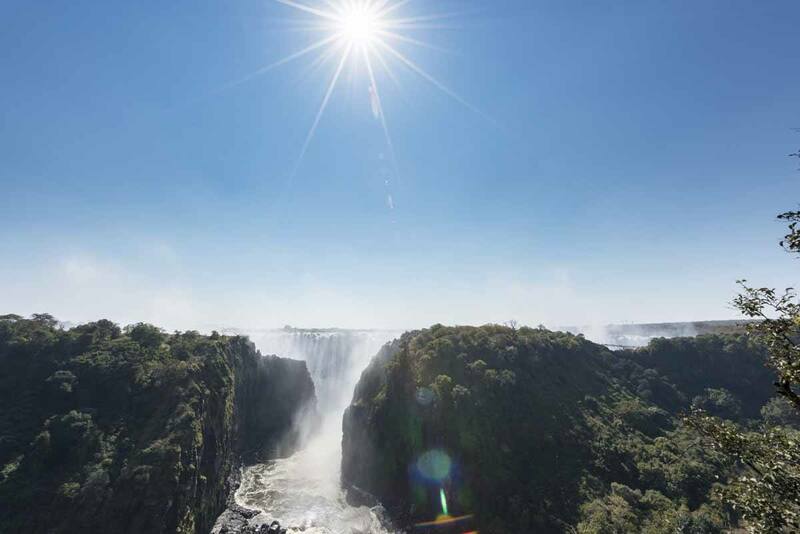 If you’re only staying on the Zimbabwe side of the Falls, you can easily walk from Vic Falls town to the national park, cross the Victoria Falls bridge between Zimbabwe and Zambia on foot, visit the falls and come back – all on foot. Between Victoria Falls town and the Falls it’s about 10 minutes walk, and another 15 to walk across the bridge to Zambia. Easy! If you’re staying in Livingstone, you’ll need to rely on taxis to move between the town and the falls, as it’s approximately 10 km each way. You can either take the whole taxi (which will cost you about $10-100 kwacha for the vehicle) or take a shared taxi ($2- 20 kwacha) – however it all depends on your bargaining skills! If you want to travel between Livingstone and Victoria Falls town (or viceversa) you have two options. 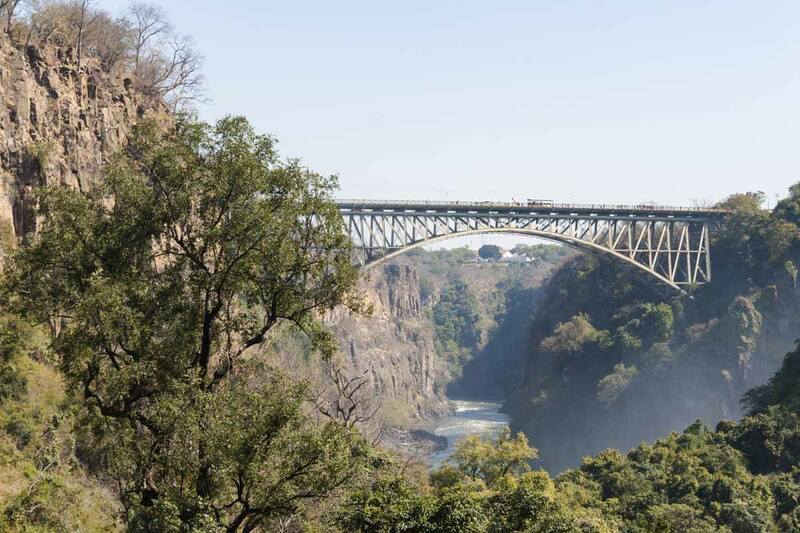 The easiest and most convenient is taking a taxi to either side of the bridge and walking across – for some strange reason, only some taxis are allowed to cross the Victoria Falls bridge. 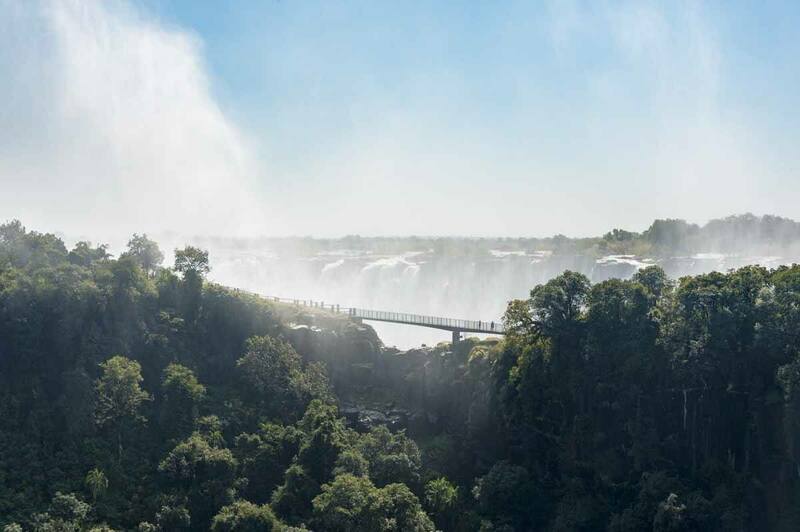 We do recommend walking as the Victoria Falls bridge is the most spectacular border crossing we’ve ever seen, with a great view of the falls themselves. However, if you have heavy luggage walking the Victoria Falls bridge may not be an option. 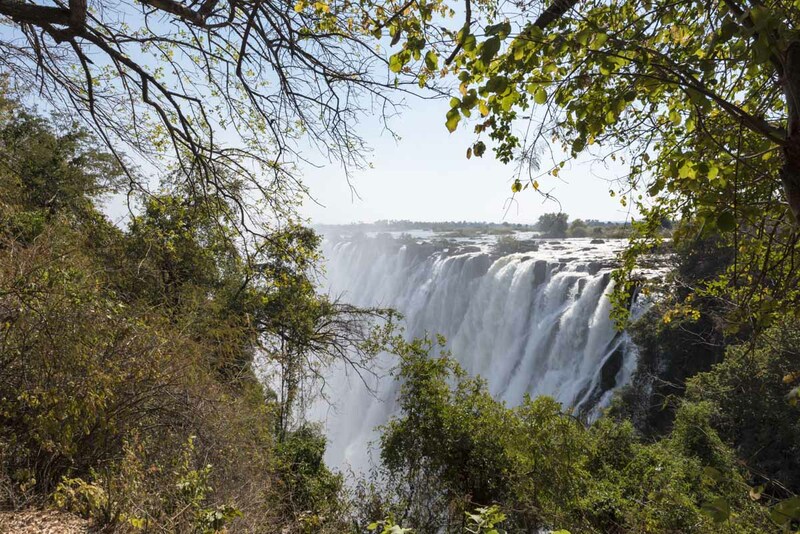 A transfer from Victoria Falls town to Livingstone will cost between $50 and 70 for two people when booked from Zimbabwe, a little less when booked from Zambia. Lots of rainbows over the Falls! There are a myriad of things to do in Victoria Falls – safaris, dinners with drums and dancing, adrenaline activities, you name it. Just one word of warning though. You’ll definitely be offered elephant safaris and lion walks by companies that advertise themselves as ‘sanctuaries’ and claim to be ‘rescuing’ orphaned and injured animals. We strongly advise you against choosing to support these establishments – more often than not they are ‘sanctuaries’ only in name, exploiting animals for tourist dollars. Just read this post about why tourists shouldn’t ride elephants and this one about canned hunting, the dark secret behind many ‘walk with lion’ experiences. 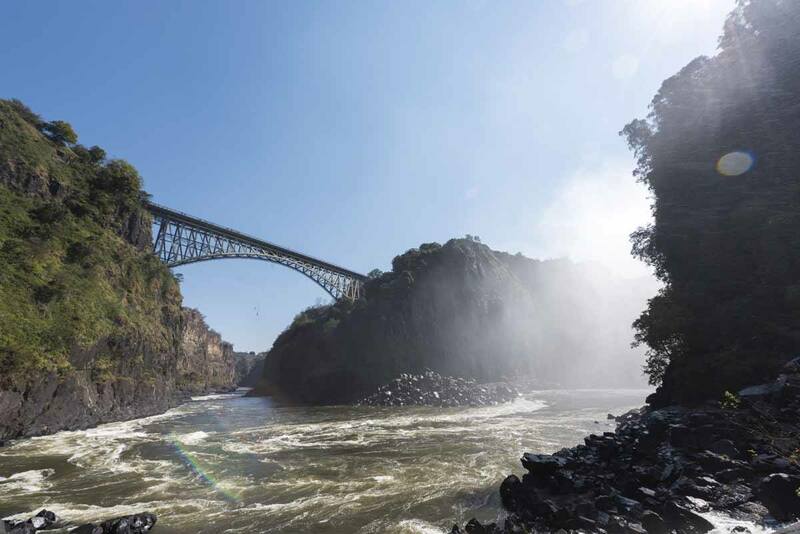 How about bungee jumping from Vic Falls bridge? However, fear not – there’s PLENTY to do in Victoria Falls besides visiting the falls themselves. Here are the most popular activities! White water rafting – some travellers described it as the SCARIEST (but also most exhilarating) rafting experience ever. It’s available both on the Zimbabwe and Zambia side and costs about $120 per person. Touts on the street may quote cheaper prices, but will take shortcuts when it comes to safety. Devil’s Pool/Livingstone Island Tours – an absolute must if you’re in the area while the island is open. 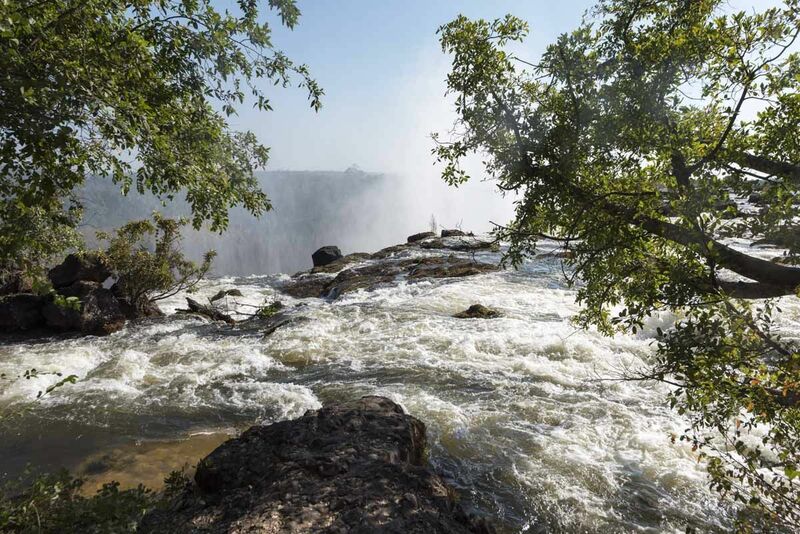 Tours depart from the Royal Livingstone Hotel and include a short boat ride, the opportunity to swim in Devil’s Pool (or Angel’s Pool when Devil’s is closed), right on the edge of the falls. Tours also include a meal and cost $100 for breakfast, $175 for lunch and $140 for high tea. This activity is only available on the Zambia side. Bike Tour – an unusual way to tour the area and discover local life around Vic Falls. Tours depart from the Victoria Falls Hotel (Zim side) last 3 hours and cost about $100. Sunset Cruise – this Victoria Falls activity probably offers the best value for money, as it costs about $50 and includes unlimited snacks and drinks! Available from Zimbabwe and Zambia. Bungee Jumping from Victoria Falls bridge – about $160 per person. Gorge Swing – available from Zimbabwe and Zambia, about $100 per person. Adrenaline High Wire (Zim side, $137) / Zambezi Pass (Zambia side, $95) – a ‘day pass’ including zip line, flying fox and gorge swing. Helicopter Flights – $150 for a 15 minutes flight. Available from Zimbabwe and Zambia. Microlight Flights – $180 for a 15 minutes flight. Only available from Zambia. Day Trips to Chobe National Park in Botswana – a truly amazing experience, including a game drive and a sunset boat safari. About $150 per person. Not far from Livingstone Island – don’t miss swimming in Devil’s Pool if you can! I’m sure you’ll all be aware of Zimbabwe’s hyperinflation in recent years and the famous ‘500 trillion’ notes that were worth less than the paper they’re painted on. As a result, the Zimbabwean government has introduced the US dollar as de facto currency. All prices in Zimbabwe are in USD – cards are very rarely accepted, you can withdraw dollars from cash machines but they’re very frequently out of cash. Make sure you take enough dollars for your chosen activities and all your needs, or else be prepared to wait in line at the one cash machine that works that day. Zambia has its own currency, the Kwacha. Inflation in Zambia is also high and the government intervenes by periodically slashing zeroes. When we visited, $1 was worth 10 kwacha. In Livingstone, hotel and activity prices are quoted in USD, while prices in shops and restaurants will be quoted in kwacha, but USD and euros are also usually accepted. In our experience, Livingstone had a safer and more relaxed vibe compared to Victoria Falls town, which felt a little like a tourist trap. Livingstone was an actual town with shops, markets, schools and people going about their business, whereas Victoria Falls town only seemed to exist in function of the falls – but then again, visiting the falls from the Zimbabwean side is far easier to arrange. We felt safe both in Zambia and Zimbabwe. In Zimbabwe, the main annoyance were touts on the road selling trinkets and billion/trillion Zim dollar notes – we also noticed several ‘tourist police’ officers, hired to keep tourists safe and make them feel safe after the recent political trouble. Generally speaking, prices are higher on the Zimbabwe side, and touts and hawkers are more aggressive – but don’t expect Egypt-style scenes. A firm no will usually be enough to convince them to leave you alone. If you decide to walk to the Lookout Cafe on the Zimbabwe side, or anywhere between Livingstone and the falls in Zambia, watch out for elephants – they’ve been known to attack people. Conclusion – Where shall I Visit Victoria Falls? Zimbabwe or Zambia? As you’ve seen, each side has its pros and cons. To best appreciate the majesty of Victoria Falls, we recommend staying on both sides for a couple of days. If you’re pressed for time, we recommend Zimbabwe, with a quick jaunt across the border to visit the Zambian side and/or swim in Devil’s Pool of it’s open. Here’s a brief recap or each side’s advantages! We spent two nights in Victoria Falls town, and two nights in Livingstone. We dedicated one day to the Falls from each side, and one day to activities – if we were to go back, we would plan a similar stay. Generally speaking, Livingstone offers better value for money, but if you want to stay something really amazing, you shouldn’t miss the Victoria Falls Hotel! Here is our selection of places to stay in Victoria Falls and Livingstone, divided between budget, midrange and luxury. Budget – Victoria Falls Rest Camp, a large campsite in the centre of Victoria Falls town, with lots of shade and outside cooking areas. Popular with overland trucks – this is where we stayed while on the Zimbabwean side, at the end of our tour with Wild Dog Safaris. Budget – Shoestrings Backpacker Lodge, where most backpackers are staying unless they’re camping. It has a communal kitchen and a cafe, and it’s a popular drinking hangout for budget travellers. Midrange – Rainbow Hotel, a quiet and affordable hotel surrounded by a garden, 1.5 km from the falls. Luxury – Victoria Falls Hotel, a colonial hotel dating back to the early 20th century. It was the Queen Mother’s hotel of choice and it’s still famous for being one of the best colonial hotels in Africa. From the hotel grounds you have a view on the gorge and the bridge, and it’s an atmospheric spot for high tea. Luxury – Victoria Falls Safari Lodge, less historical than the previous one but offering top-notch service and facilities, with thatched bungalows overlooking a waterhole. Budget – Fawlty Towers, a great laidback hostel with a nice atmosphere, a swimming pool and free pancakes every day at 3 pm. Free shuttle service to the Falls on offer. Budget – Jollyboys, another long-running backpackers favourite, with a swimming pool, a BBQ area and a great communal seating area around the fire. Also offers free shuttle to the falls/border. Midrange – Guesthouse Olga’s Italian Corner, a small hotel adjacent to the famous Italian restaurant/pizzeria of the same name. 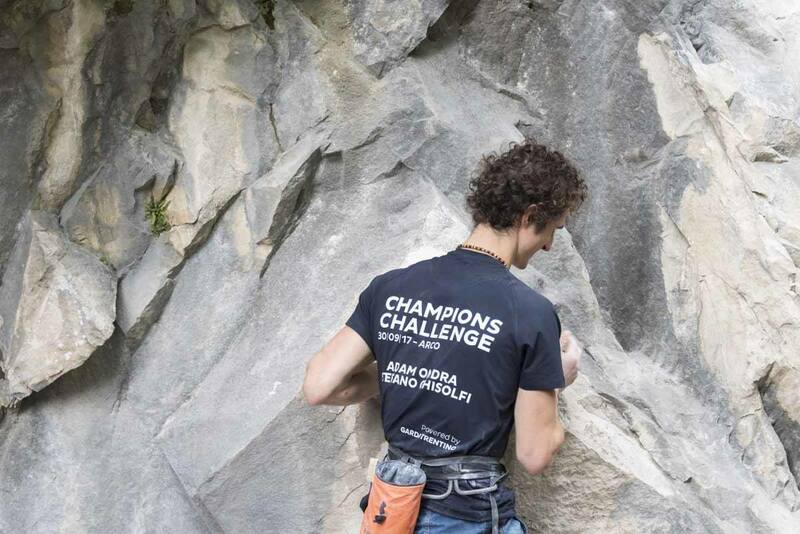 It is run by an Italian NGO offering training opportunities to disadvantaged young people. Luxury – The Royal Livingstone, located on the banks of the Zambezi, this is to Livingstone what the Victoria Falls Hotel is to Victoria Falls town. It doesn’t have the colonial history but it makes up for it with a great location and facilities, including a spa. Luxury – Avani Victoria Falls Resort, formerly known as the Zambezi Sun. This is a resort-like complex by the Zambezi, walking distance from the falls. Zebras are often spotted grazing on the lawns. Don’t forget to pack your raincoat or rent one at the Falls! Once again, food is considerably cheaper on the Zambian side, but both places have good eateries. Here are our faves! Mama Africa – offering traditional African fare like stews with pap, curries and grilled chicken. Lookout Cafe – worth a visit for its stunning location over the gorge, where you’ll see daredevils braving the gorge swing. Watch out for elephants on the path from Vic Falls town. Serves a selection of international dishes, pizzas and burgers. The Three Monkeys – a popular pizzeria by the railway station, offering also other international dishes and burgers. Cafe Zambezi – a café with an eclectic selection of African, Caribbean and international dishes, including many vegetarian options and delicious veggie burgers with blue cheese. Olga’s Italian Corner – the best pizzas this side of Italy. It’s run by an Italian NGO and pizzas and pasta are literally to die for – you can also enjoy unusual dishes like parmigiana and pumpkin ravioli, common in Italy but not really in Zambia! Many thanks to Wild Dog Safaris for welcoming us on their African Odyssey tour. Honestly, don’t miss visiting Victoria Falls!